I have yet to see these films, but after seeing THE WAY WE ARE, will quickly remedy this. THE WAY WE ARE caught me completely by surprise. I was startled that such a small film with absolutely no commercial value was made and released in Hong Kong. 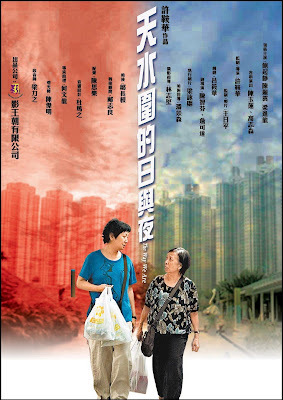 The Chinese title of this movie is "Tin Shui Wai Days and Nights," and it's a fitting one. The film is set in Tin Shui Wai, a.k.a. The City of Sadness, and follows a hard-working mother and her teenaged son over a few months. She works at the supermarket. He hangs out with friends but doesn't get into trouble. He's waiting to find out the result of his Form 6 test. They visit their relatives, who are wealthier than them. The boy's grandmother gets sick and is hospitalized. The mother says she is too busy to visit the grandmother at the hospital. In effect, the movie trudges along on the strength of a handful of false leads. Is there some dark family secret behind the mother's not visiting the grandmother at the hospital? Will the boy get into Form 6? Will the mother eventually lose it and unleash the pent-up anger and resentment from the sacrifices she's had to make all her life? Will the boy be led astray by his friends and commit some horrific crime? But none of these things take place. Instead, the major event in the movie is that the mother and son befriend a neighbor, an elderly woman who is alone in the world, and form their own family unit. This film has won critical acclaim and has been praised for its integrity of vision, subtlety, and refusal to depict a troubled slum in a negative or sensationalistic manner as other films have done. 1) nihilistic hell-on-earth story in which crime, violence, and drugs prevail and all hope goes out the window. 2) quiet dignity of individuals despite the odds socially-conscious story - these films are usually about community activists or young people who find a way out of the ghetto and often contain brief snippets of 1) nihilistic hell-on-earth to contrast and heighten their protagonist's dignity. THE WAY WE ARE definitely falls into the second category. But what's noteworthy is that unlike other movies of this type that are made elsewhere, THE WAY WE ARE categorically refuses to point the finger of blame for the plight of its protagonists at any social or government institutions, individuals, or even deities. It seems as if the two main characters have no problems whatsoever. And the only complaint the mother ever voices is that the newspaper stand guy was mean and didn't give her the free pack of tissues that the convenience store guy gives. I don't know what to make of this lack of finger-pointing. I simply found it to be unique. Also as an outsider, I found great interest in the film's numerous depictions of the minutiae of daily life, and the film worked for me also on the level of anthropology. But above all, the film struck a chord in me by being so very different from other Hong Kong movies. On top of all that, seeing the elderly third character in the film deal with her loneliness made me pick up the phone and give my parents a call. If that's not a testament to the power of cinema, I don't know what is. Thanks for the review. I'll try and see it. You didn't mention it, but if you can, also see a copy of her "Summer Snow" (Cantonese title, "A woman of 40").